Add the cubed sweet potatoes, diced onions, crushed garlic, Himalayan pink salt, black pepper, cayenne pepper, red pepper flakes and extra-virgin olive oil to a skillet and saute' on medium heat for approximately 20 minutes, or until the sweet potatoes are soft and slightly crispy on the outside. Adjust seasonings to your preference. 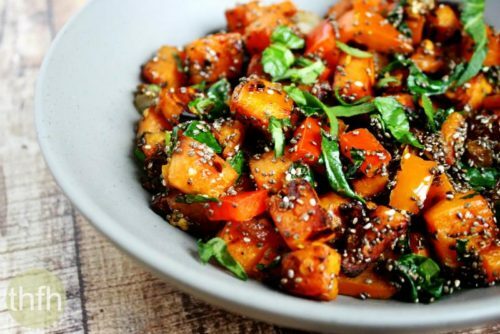 Add the diced red bell peppers, chopped spinach and chia seeds and gently toss for about 1 minute, or just long enough for the spinach to wilt. Remove from heat, garnish with fresh chopped spinach and serve.